One of the most romantic and unique wedding theme ideas for an exotic wedding in Phuket is to combine a beach wedding along with a Buddhist blessing by monks which is then followed by a western ceremony on one of Phuket’s tropical beaches. Indulge yourself and opt for a wedding ceremony where East meets West in this colorful and vibrant marriage of traditions and customs. 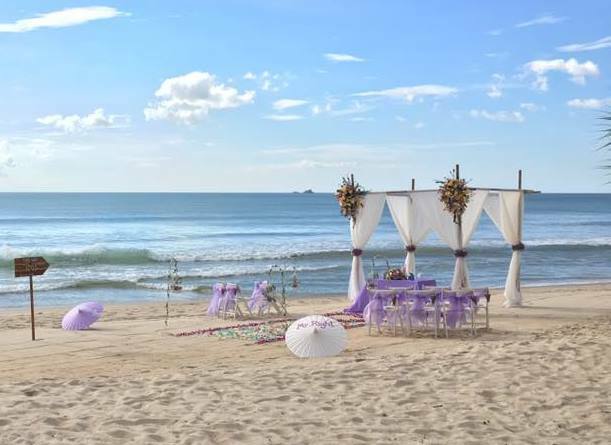 The Thai Beach package blends both the harmony and splendour of the Buddhist ceremony with the simplicity and romance of the western wedding to create an everlasting impression that will be cherished and treasured for years to come. 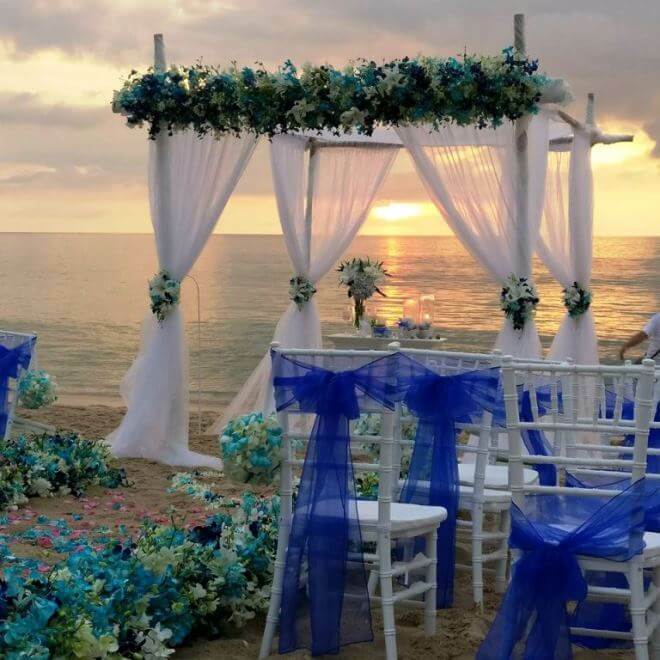 With the spectacular backdrop of the setting sun over the ocean this Thai beach package will guarantee a ceremony with memories that will last a life time. This package is a combination of the Superior Beach package and the Monks Blessing package at Wat Chalong Temple. 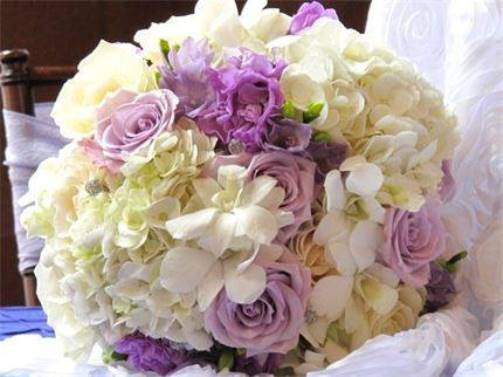 Prior to your special day the wedding planner and marriage celebrant will meet with you at your hotel to discuss and go over all your wedding theme ideas for your special day, including your personal ceremonial vows. The Thai Beach package includes a host of inclusions from the bridal bouquet, corsage, flower decorations for the altar, a professional photographer, a non official wedding certificate and photos. On the day of your ceremony a professional make-up artist and hair stylist will go to your resort to style the brides hair and apply her makeup. When ready the Bride and Groom and any guests will be picked up and transported from your resort to Phuket’s largest and most visited temple "Wat Chalong". Here the bride and groom will be blessed by five monks, a truly memorable experience, one of those wedding theme ideas that should be incorporated into your wedding plans when getting married in Thailand. The monks Buddhist blessing is part of a Buddhist ceremony, but even if you are not a Buddhist it is absolutely appropriate as well as impressive. Accordingly to local belief this blessing will bring your relationship good luck and harmony. 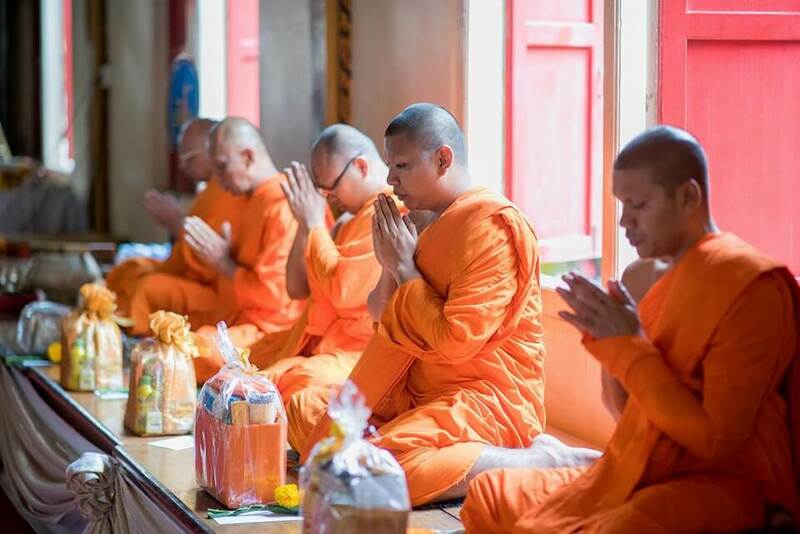 The Buddhist blessing includes chanting and blessings by the monks as well as handing over of offerings. After the blessing there is time for photos in the temple area. From Wat Chalong you will be transported to the beach for your western ceremony. You and your loved one, wearing beautiful flower garlands, will stand on the sand in front of the altar making the most important promise of your life to one another. Following the ceremony the Bride and Groom will cut the wedding cake while sipping champagne. A short walk on the beach watching the sunset completes your most important day of your lives together. The combination of the monks blessing and the beach ceremony is a romantic and unique way to exchange wedding vows, and is the perfect package for a destination wedding in Phuket. All the beach wedding packages can be customised to suit your requirements. 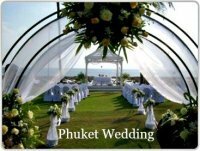 If you would like to find out more information about other wedding theme ideas or for more information including prices of the Thai Beach wedding Package, please complete the following contact form. By completing this contact form your details and any questions you may have will be sent onto our preferred and most trusted planner in Phuket.